Are you planning to make new business cards for yourself and your employees? This is certainly an important step in promoting your business and establishing long-term relationships with your partners or customers. A successful business card will convey your professionalism and ability to get to the point. This impression is created by tasteful design and high print and paper quality. The new Business Card Maker makes these available to everyone. Thanks to this state of the art software you can implement any business cards ideas and produce exquisite business cards in-house rather than giving this job to design studios. 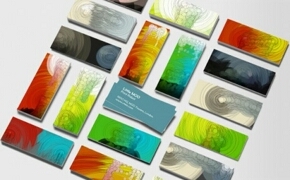 Well, you have decided to design your own business card, but where can you get winning business cards ideas? The best thing to do is to collect all the visiting cards from different companies that you keep in your desk. Have a look at them and pick the ones that truly catch your eye. These will probably belong to successful businesses that you respect and deal with. Try to discover the connection between these companies’ activities and the look of their corporate cards. Reflecting on this connection will definitely prompt you some great business cards ideas. You can also get inspiration for a fresh design if you download Business Card Maker and make some sample business cards from professionally designed templates. However stylish and complete they may seem, no doubt you will wish to customize the template so that it is unique to your business. For example, replace any clipart image on the ready-made template by your corporate logo. If your company has corporate colors, limit yourself to these – a harmonious color scheme may include up to three colors. Make sure any additional colors don't clash with your corporate color. Some unconventional business cards ideas take the kinesthetic factor into account. 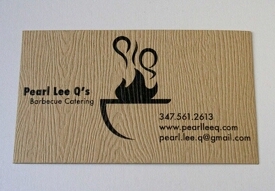 It is vital that your business card is not only eye-catching, but also pleasant to touch. High quality paper is a must. Besides, paper manufacturers offer a wide range of textured paper. This will be a perfect solution for minimalistic business card design. On the other hand, glossy paper should normally be avoided, since it is not suitable for writing, while a business card should be interactive, letting the person make some extra notes on the reverse side.